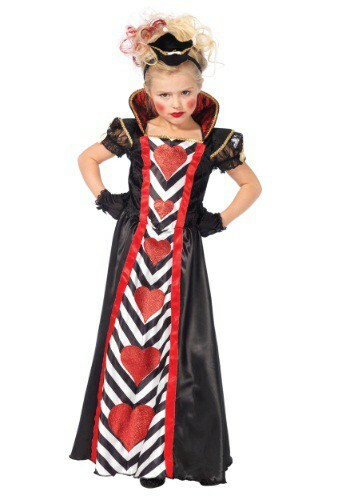 Did you know that the Queen of Wonderland was once a very mild mannered child? Some psychologists have reasoned that her extremely fiery personality may be the direct result of never getting to dress up for Halloween. She was especially drawn to masks, which she was never allowed to wear. And thus…off with his head she went. We don’t want to tell you how to parent or anything, but you don’t really want your kiddo running around executing a bunch of playing cards, do you? This Girls Wonderland Queen Costume is a win-win: she gets the ultimate fantasy dress-up experience she’s been longing for, and you get to let her blow off a bit of steam in a controlled (not to mention cute) way. She thinks she has what it takes to rule Wonderland; once she’s decked out in this outfit, you can try to teach her that the best rulers are fair and kind but...honestly...she’s going to draw inspiration from this dress’ dramatic visuals and and stiff, stand up collar. Don’t worry, she’s just pretending to be so tough! You still wear the crown around your palace. She’ll be so happy to slip on her own crown headband,though, that she’ll likely forget all about the whole evil queen bit and befriend Alice and trick-or-treat with her all night!